Things have been a bit quiet on this blog however life has been busy – and yes cooking / baking has still been happening – it never ends 🙂 Two weeks ago, I had just finished our Lifestyle Challenge where I had been following a strictly paleo diet for 8 weeks! It has been interesting with lots and lots of cooking, awesome recipes that I cannot share and a result of 3.5% loss in body fat. More on that in a post sooner than later! 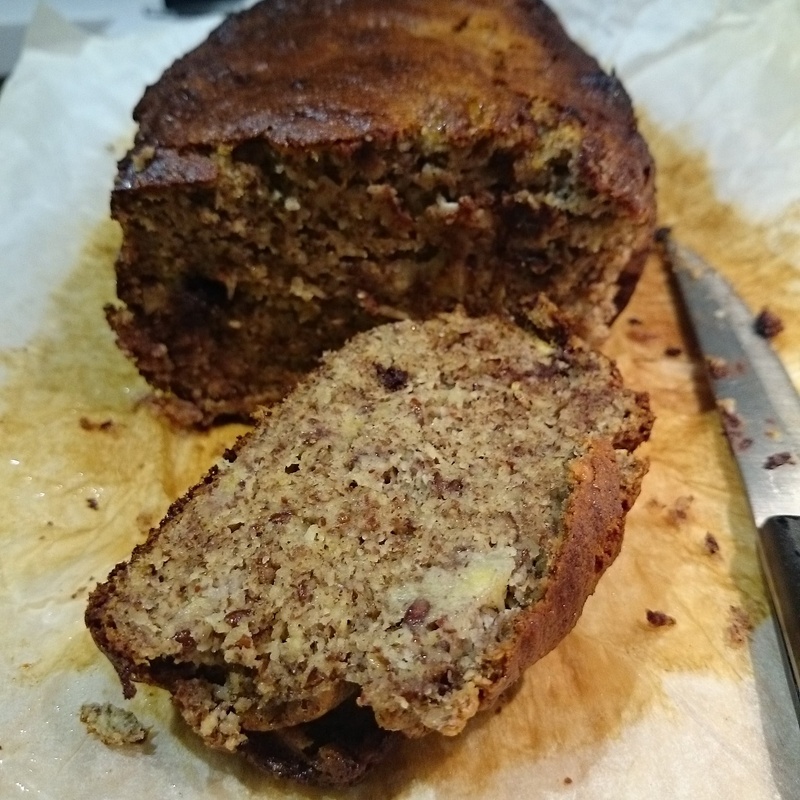 For today, a beautiful banana bread I made last night to have for breakfast/ snack during the week. Banana bread on its own is heavenly however I opted to also add some dark chocolate in there just because! Throw in some coconut milk dark chocolate and the bread is paleo! The result is some delicious chocolate gooey surprise as you indulge in the bread! The batter was soooo delicious and I just knew the bread was going to be awesome! The original recipe is from Teresa Cutter – The Healthy Chef. 1. Preheat your oven to 160 C.
2. Combine smashed banana, honey, oil, cinnamon, vanilla, eggs, bicarb and lemon juice, by hand in a large bowl. 3. Add the almond meal, flaxseed and chocolate pieces and mix well. 4. Lightly oil one loaf tin and then coat liberally with extra almond meal or desiccated coconut – this will prevent the cake from sticking. I used a silicon mould so needed none of the above! 5. Spoon batter into the tin and bake 1 hour ( a skewer inserted into the centre should come out dry). 6. Cover the top with foil if over-browning. 7. Remove from the oven and allow to cool before turning out the loaf. * Made from almond meal, expect the bread to be dense and moist. It is best had the next day (if you can wait!) and toasted with some butter! YUM.